Before starting, the pasta chicken was cut up. The chicken would be cooked and added in later. On a warm summer afternoon, we (Nico Gatapia and Andrew Tow) drafted a to-do list under the aliases Nicole and Andy respectively. We thought of many ideas including, but not limited to: skating at Skate City, attending a symphony and getting caught doing something mildly illegal. We completed very few items on our to-do list, but the one thing we consistently completed was cooking every Tuesday. Both of us found ourselves either unsatisfied with food we ate, or emptying our wallets for a decent meal. We wanted to cook to improve our culinary skills in preparation for the adult life, but most importantly, to get the ladies in college. 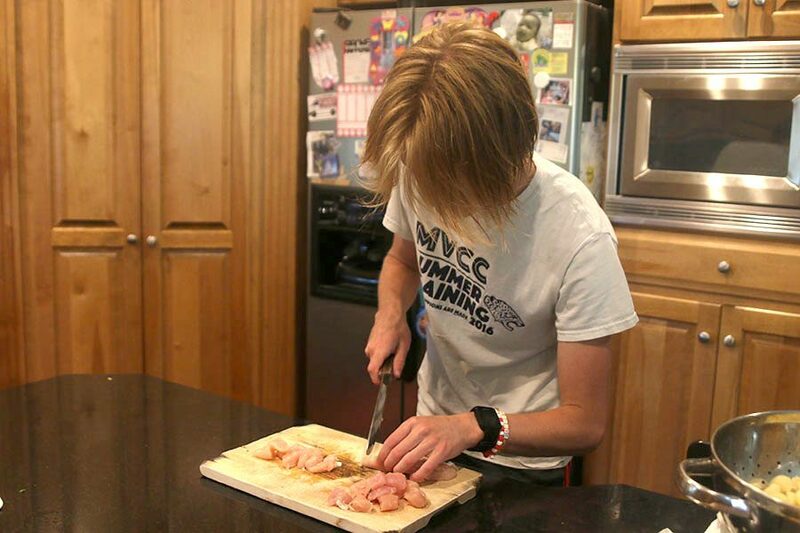 Girls dig guys that can cook. And, cooking is a hobby that can stir conversation with anyone, even someone you would have never talked to in other circumstances. Besides, who doesn’t love food? Here at Nicole and Andy Cook, we believe that cooking is an important part of life that should be both mastered and cherished. Ever since we started cooking, our cooking ability has transformed completely. At first, we had trouble making fried rice, but now, we can make traditional ramen or biscuits and gravy from scratch. We eventually created an Instagram account under our aliases @nicoleandandycook. There we shared our creations and gathered a following of 263 followers. We have already made efforts to gain sponsorships and collaborate with other successful food accounts. One day, we will become an icon within the foodie community, sharing our immense knowledge as full-fledged Instagram influencers. The first dish made during the summer was a chicken parmesan baked ziti, but instead of ziti, shells were used due to their superior quality. This is a dish that is really easy for beginners in the kitchen but is still delicious. The blanket of stringy mozzarella cheese on top of a savory tomato-basil sauce delivered to your mouth via perfectly al-dente shells with a little basil to add a little freshness is sure to make everyone’s mouth water. Here, in the first installment of Nicole and Andy cook, we are going to recreate that great day. Slice the chicken into desired shapes and sizes but make sure size is similar so the chicken will cook evenly. Season the chicken with salt and pepper and saute with olive oil. Boil the pasta until al dente (firm, but not crunchy). Strain the pasta in a colander and put the pasta back into the pot. Mix the tomato basil soup, pasta, and chicken in the pot. Grease a baking dish and pour the pasta over evenly. Cover that baby with copious amounts of cheese. Bake for 20-25 minutes or until the cheese starts to turn into that nice golden brown. Sprinkle your creation with more parmesan cheese and basil. Nico Gatapia: Height: 5’6” Weight: 126 lbs. Favorite Beverage: Water. Favorite Dessert: Double Stuf Oreos dipped in 2% milk for 15 seconds. Greatest Fear: Being mutilated by heavy machinery. Hobby: Avid napper. Andrew Tow: Height: 5’ 9” Weight: 120 lbs. Favorite Beverage: Agua. Favorite Dessert: Snack Shack ice cream cones. Greatest Fear: Getting busted. Hobby: Recreational whistling.